As the fitness industry booms and more low-cost fitness centres appear across the country, David Lloyd Leisure, Europe’s largest and fastest growing group of premium health clubs, needed to drive brand awareness and understanding of the value and benefits of its premium price tag. We used an MVP approach to campaign testing from audience to creative strategy, driving learnings before scaling up. This began by isolating David Lloyd’s key growth audience segment of ‘Prosperous Families’ – high income parents with children in the club catchment areas. Together with Facebook’s Creative Shop, we ran a ‘Creative Hack’ which aimed to produce eye-catching mobile-first video assets to use in place of static imagery to really grab attention and drive a response. Creative breadth was critical to driving brand consideration (especially for families with diverse needs); we used Experian data segments together with insights into club usage to guide the content which featured an outdoor swimming pool, tennis, spa and children’s club to showcase the breadth and depth of David Lloyd’s facilities important to both parent and child. By using existing assets and adding simple motion we were able to create eye-catching video without necessitating the budgets required for full-scale video production, turning the brand’s direct response creative into a mobile-first, immersive experience. 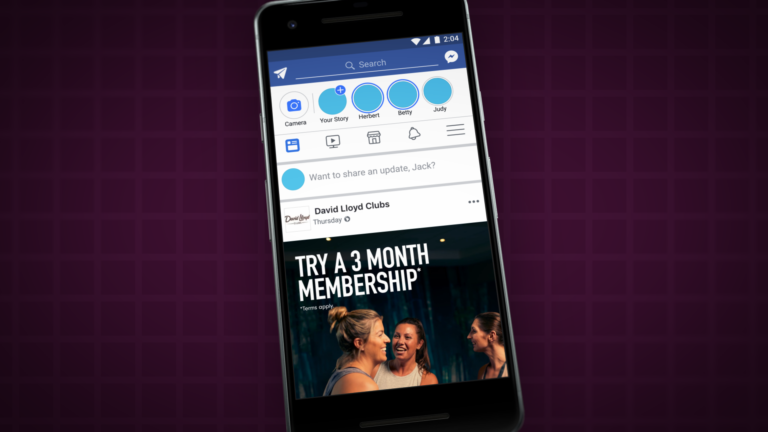 And as a result, we identified a growth opportunity within the digital marketing strategy that saw social grow from 40% to 73% of David Lloyd’s online acquisition budget and further roll-out of motion ads in new placements, across a wider social channel mix.